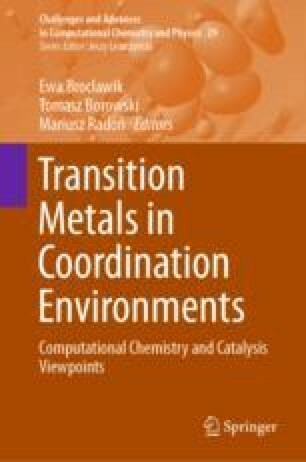 Chemical bonding in transition metal complexes is typically described by Dewar–Chatt–Duncanson model which separates donation (ligand → metal) and back-donation (metal → ligand) charge transfer processes—these are with no doubt crucial factors which determine a number of properties of metal complexes. This contribution highlights the importance of various non-covalent interactions including untypical homopolar dihydrogen contacts C–H•••H–C in metal complexes. The selected systems are: (1) Zn(II) species containing NTA (nitrotriacetic acid), NTPA (nitrotri-3-propanoic), BPy (2,2′-bipyridyl) ligands, (2) cis-NiL2–hexane (L–thiourea-based ligand) complex, and (3) hydrogen storage materials LiNMe2BH3 and KNMe2BH3. It is shown consistently by various methods and bonding descriptors including for example the charge and energy decomposition scheme ETS-NOCV, Interacting Quantum Atoms (IQA), Reduced Density Gradient (NCI), Quantum Theory of Atoms in Molecules (QTAIM) and NMR spin-spin 1J(C–H) coupling constants, that London dispersion dominated C–H•••H–C interactions and other more typical hydrogen bonds (e.g. C–H•••N, C–H•••O) driven mostly by electrostatics, are crucial for determination of the structures and stability of the selected metal complexes. Although London dispersion forces are the fundamental factor (~70% of the overall stabilization) contributing to C–H•••H–C interactions, the charge delocalization (outflow of electrons from the σ(C–H) bonds engaged in C–H•••H–C and the accumulation in the interatomic H•••H region) as well as electrostatic terms are also non-negligible (~30%). Remarkably, hydride–hydride interactions B–H•••H–B in LiNMe2BH3 are found to be repulsive due to dominant destabilizing electrostatic contribution as opposed to stabilizing C–H•••H–C. DFT calculations were partially performed using the PL-Grid Infrastructure and resources provided by the ACC Cyfronet AGH (Cracow, Poland). M. P. M. acknowledges the financial support of the Polish National Science Center within the Sonata Bis Project 2017/26/E/ST4/00104.